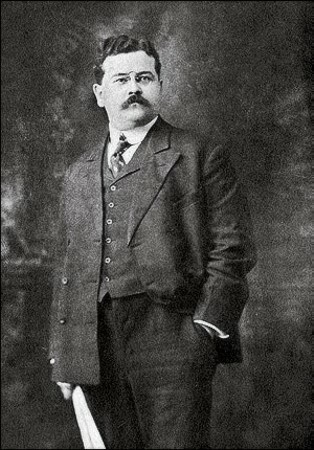 The American Charles Hoy Fort (1874-1932) is perhaps the godfather of postmodernist relativism. He called himself an ‘intermediatist’, one who believes that “all phenomena are approximations one way or the other between realness and unrealness”. He would not commit himself to any single view of the world. A lifetime of collecting reports of unusual events in the New York City Library never led him to develop a paradigm that would accommodate them. Instead he would conjure up completely fanciful ideas that were clearly intended to be jokes, such as his ‘Super Sargasso Sea’, floating above the earth, which had become a repository for all sorts of débris sucked up from the surface of the earth by tornadoes, and from which otherwise inexplicable objects, such as frogs, would occasionally fall to the ground. His collection of reports ran from lumps of flesh falling from the sky to psychic phenomena, from ghost stories to mysterious flying objects and from human artefacts found in geological strata to spontaneous human combustion. He published his collections and speculations in four books: The Book of the Damned (1919), New Lands (1923), Lo! (1931) and Wild Talents (1932). The books work by piling up account after account, leaving the reader bewildered rather than enlightened. There is no attempt to evaluate the reliability of his sources, to assess whether any of the phenomena are physically possible or to understand the nature of theory. One of his great preoccupations is what he saw as the religious nature of scientific discourse. He believed that scientists constitute a type of humanist priesthood and that they uphold their own beliefs by suppressing inconvenient data rather than arguing from the evidence. While understanding that scientific theories model the world rather than describe it, he believed that their inability to deal with anomalous data showed that they were inflexible, dogmatic in their beliefs. One of Fort’s admirers, the actor Tiffany Ellsworth Thayer (1902-1959), created a Fortean Society to collect more anomalous data with the aim of embarrassing conventional science. After Fort’s death, the Society began to publish his voluminous notes. When Thayer died in 1959, the Society folded, but by then, numerous people had become attracted by his ideas (if not his books). There are now several societies that describe themselves as Fortean, as well as magazines and even a British television programme (Fortean TV, an occasional series shown by Channel Four). Ironically, Charles Fort himself did not like the idea of a Fortean Society, as he thought it would attract people who truly believed in the strange phenomena he was cataloguing. All in all, Fort stands out as something of an oddity. The data he collected are heterogeneous and probably incapable of synthesis; his perfunctory attempts at synthesis are risible and (presumably) not meant to be taken seriously. The point he seems to be making is that it is possible to use the data science rejects to construct an alternative paradigm, by which all the accepted data become anomalous. In short, the accepted paradigm is wrong just as much as the alternative paradigm is wrong. But, in Fort’s view, scientists are not the right people to come up with the new paradigm because their knowledge is socially constructed and therefore no more valid than his speculations. This is why we can regard him as a godfather of postmodernism.